Bored of being asked the same questions at Q&As, Nikesh recorded a podcast of conversations with other writers that were irreverent, freewheeling and informative. Topics covered included speedos, R Kelly, literary snobbery, heart-throbs and writing processes. 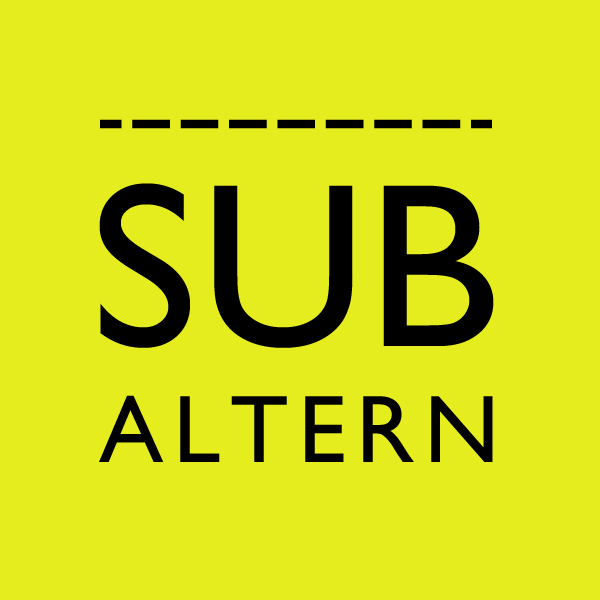 Subaltern: persons socially, politically and geographically outside the hegemonic power structure. You can download the episodes below. Episode 32: Andrés Neuman - Nikesh and Andrés talk about cubist genitalia, avenging football teams, the act of translation, laziness and cuddles. Episode 31: James Salter - Nikesh meets a hero, tries not to get too sycophantic. They talk about James Salter's career, his new book, whirring projectors and technology. Episode 30: James Smythe - Nikesh and James chat about last lines in movies, Breaking Bad, The Killing, Battlestar Galactica, Damon Lindehoff, science fiction, television, glorious brilliant television. Episode 29: Nick Harkaway - Nick and errr Nik talk about the internet, about literary realism, about snobbery, about how the internet is warping our minds at the same time enhancing it. Episode 28: Chris Ware - Nikesh and Chris talk about printed books, geeks inheriting the earth, how on earth someone puts together something like Building Stories. Episode 27: Jennifer Egan - Nikesh and the lovely Jenny talk about Black Box and its inception, lurking on Twitter, are da yoof reading less?, why she writes and what Nikesh tells creative writing students. Episode 26: Kevin Barry - Nikesh and Kevin talk about standing up writing, how to write about technology (proving a recurring topic), what Kevin bought with £30k, broadband problems, grizzled detectives and film. Episode 25: Salena Godden - Kesh and Sal talk about looking at tree patterns, some of their greatest hits, her first gig, why she writes what she writes and the smell of cooking. They talk about all her projects too. Episode 24: Daniel Tatarsky - Kesh and Dan spend 40 minutes talking about Dan's various acting jobs, researching Dan Dare, the corridor of uncertainty and swearing at your team-mates. Episode 23: Zadie Smith - Zadie tells Nikesh about NW, about how it was meant to be shorter, about Jay-Z, about realism and technology in literature, about James Baldwin. Nikesh tries and impress Zadie. Zadie indulges Nikesh. Episode 21: Alex Preston - Alex talks about his third novel, about the big digital question in the face of piracy and changing reading habits, about various religions, about teaching. Alex and Nikesh talk about writing short stories, long novels and taking holidays. Episode 20: Jenn Ashworth - Jenn and Kesh talk about saving libraries, why Napoleon Dynamite is an impossible film, her love of stationary, regional differences and unreliable narrators. Episode 19: Joe Stretch - Joe and Nikesh talked about their love of reading, The Dark Knight Rises (oh boy, it gets heated) and what songs they want played at our funerals. Joe and Nikesh discuss The Adult at length because it's one of Nikesh's favourite books of the year. Episode 18: Elizabeth Day - Elizabeth and Nikesh get through a lot: they've not read each other's books, Nikesh tells an embarrassing teenage asking a girl out story, they celebrate Dr Dre, they talk about writing, they talk about Clint Eastwood. Elizabeth touches her nose with her tongue (an audio delight) and they play sunglasses tennis. Episode 17: Todd Zuniga - Kesh and Todd talk Literary Death Match's international status, hobnobbing with the stars in LA, whether writers in New York actually like each other and the new season of Breaking Bad. Episode 16: TM Wolf - Tom and Nikesh talk about Sound - how it came together, how it was written and... hip-hop. This is an episode for hip-hop fans. They talk about music journalism, Outkast, A Tribe Called Quest, Curren$y, mixtapes, Wu Tang's first album. It's a nerd-out. All with authentic New York taxicab noises in the background. Episode 15: Stuart Evers - Stu and Kesh talk about If This Is Home, web 2.0 vs writing, writing about home and where Stuart gets his ideas from (spoiler alert: his mum). Episode 14: Dorian Lynksey - Dorian talks about his favourite protest songs, Nikesh tells us about his ill-advised idea for a dissertation once, they both discuss how to write about music and music in a digital age. Episode 13: Lee Rourke - Lee and Kesh meet up to talk about football hooligans, the geometry of cricket, how weird Canvey Island is, Lee's work and what he really thinks about Beckett. Episode 12: Nadia Kamil - Naddles and Keshles talk about... foreigner name politics, Boris Johnson, unicorns and working with John Cleese. Episode 11: Niven Govinden - Niv and Nik talk about why Tamwar from Eastenders is a comedy genius, writing by hand and keeping your work private. They also talk about Niven's new book, Black Bread, White Beer which is out on Fourth Estate India. You need to check it out. Episode 10: Edward Hogan - Ed and Nikesh talk about films starring Seth Rogen, the seedy underbelly of a Craig David interview, what they think about when they walk towards train stations. Episode 9: Teju Cole - Nikesh and Teju talk about the country of Africa, the monetary worth of critical acclaim, their love of Das Racist and Mos Def's namechange. Episode 8: Jon McGregor - Jon and Kesh talk about going on tour, the power of stand-up, where the stresses lie in Jon's book titles and being in the middle of nowhere. Episode 7: Etgar Keret - Etgar and Nikesh talk about: the difference between short stories and screenplays, humour in literary fiction, his relationship with the translators of his work (in particular Nathan Englander) and writing. Episode 6: Colson Whitehead - Colson and Nikesh speak about zombie etiquette, rap, being labelled ethnic authors and what tourists should do in New York. Episode 5: Rebecca Hunt - Becks and Shuks talk about everything: drawing pictures of furniture, her crap phone, his experiences of wearing speedos, a harmonica-playing horse and their favourite rap lyrics. They're in a bar. There's an afrobeat soundtrack. It's funky. Episode 4: Gavin James Bower - GJB and NS talk about R Kelly, Michael Jackson's videos, Eddie Murphy's seven best films, writing non-fiction, summing up Burnley and Sky Plus. The evil Sky Plus. Episode 3: Joe Dunthorne - Joey D and Shuky Shuk discuss writing, performing live, viral videos and taking writing holidays. Episode 2: Evie Wyld - Discussions include sheep, more sheep, good and bad tattoos, doppelgangers, what really happens in mining towns and labiaplasty. Episode 1: David Whitehouse - Discussion involves: Nikesh's lack of professionalism, the choice of venue, second novel syndrome (soon to be a running topic), writing and whether David's a literary heartthrob or not.